This colorful sculpture is simply breathtaking. It features a beautiful End Of Day series color mix, meaning it is made with a variety of colors used throughout the day. The colors are very deep and intense, and contain nearly every color in the rainbow. Make sure to zoom in to see the vivid colors and unique texture. There are globs of once molten glass dripping down the side adding another dimension to an already amazing sculpture. 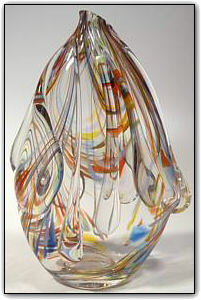 This is truly a one-of-a-kind special work of art guaranteed to impress!